North Korea’s missile program is stimulating a weapons race in Northeast Asia. North Korea has the ability to start a weapons race, a war or other unpleasantness, but their finish always rests with the Allies. Japanese Defense Minister Inada told a Diet committee on 15 May that the government will try to improve its ability to intercept ballistic missiles. Inada said the government is researching a variety of options, including “Aegis Ashore”. She commented on a proposal by the ruling Liberal Democratic Party that the government consider granting the Self-Defense Forces permission to attack enemy bases. She said the government needs to take the proposal seriously and to bolster deterrence through the Japan-US Alliance. Last November, Inada visited Guam for a demonstration of the Terminal High Altitude Area Defense system. The government favors the Aegis Ashore system. “China confirmed that it had requested North Korea to refrain from conducting a nuclear test. The Chinese also told us that they informed North Korea that China would be taking sanctions action on their own if they did conduct further nuclear tests,” US Secretary of State Rex Tillerson said on 27 April. China told North Korea that the embargo would be complete, by land and by sea. On the night of 19 April, Chinese border police maintained the highest-level alert along the North Korean border in anticipation of a North Korean nuclear test. It never came. This is the first open source report that accounts for North Korean behavior in the third week of April. This also is the first time China has exerted such pressure on North Korea and the first time North Korea has changed its behavior because of a non-military threat. China is the only country that can impose a complete embargo on North Korea, which would be unprecedented. 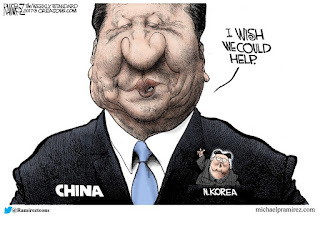 China can wreck the North Korean economy. The Chinese warning explains the volleyball game at the nuclear test site, which was staged probably for the benefit of Chinese imagery systems. It also explains the shrillness of the 3 May North Korean media rant against China. As for China’s persistent denial that it has the ability to influence North Korean behavior, that denial has been exposed as false. The Chinese found a way without using military force. This is a text book case of a successful warning. The nuclear test did not occur because national decision makers received early and sufficient warnings that were regularly updated in time for them to take action to deter the nuclear test. Seldom do analysts obtain this kind of confirmation that warning worked. President Putin said, "I want to confirm, we are against expansion of the nuclear powers club, including the Korean Peninsula, including North Korea." He also said, "What we have been observing lately in the world, in particular, outrageous violation of international law and invasion of the territory of foreign states, regime changes and so on, triggers this arms race," Putin said. While nuclear or missile tests are 'unacceptable', the international community should return to a dialogue with North Korea and 'stop intimidating' it." I repeated Putin’s comments in full because elite, smug, incompetent US news outlets only reported the last line about dialogue and intimidation. China has its hand on the North Korean throttle and everyone knows it. The only talks that matter are talks between China and North Korea. The US will defend its allies in Japan and South Korea, but any change needs to come from China and the dog on its leash. If China wants to further militarize Japan and South Korea, it can. Thus it's protests about THAAD deployment and a mobilizing Japan are hollow. Removing the threat will calm things down and that's 100% a China problem. It's inherently dangerous and in a nanny state, protecting you is job one for the government. Therefore the Australians have enacted the LOG-YOUR-JOG ordinance. 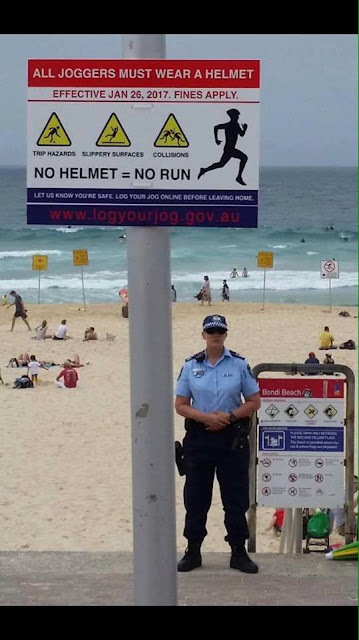 In addition to logging on to file a 'jog plan', you're expected to wear a helmet while jogging. When I heard about this, I felt that it would be likely that the City and County of San Francisco would do the same thing (exempting illegal aliens/wetbacks). Yes of course, it's a hoax. But it underscores how absurd people are and how likely they are to believe even this sort of patently tom-foolery as credible and even likely to be the case. This is how far we've sunk. In California, things like this are announced all the time and they're not hoaxes. In California there is usually a hefty tax involved. In this case it would be a "jogging tax"...which hasn't been enacted, but who knows. This may give California or its counties an idea.